This year the Center added bird feeding stations along our 50-foot viewing deck. 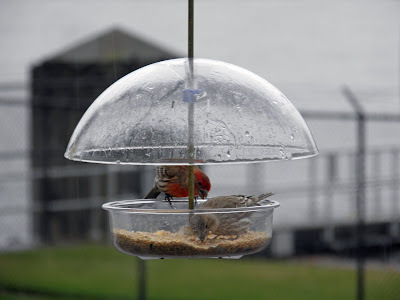 This spring we've been overwhelmed with Red House Finches. This photo of a male and female was taken through the glass door during a rains storm. Learn more about the beautiful Red House Finch and their vibrant birdsong.